Horizontal rectangle. 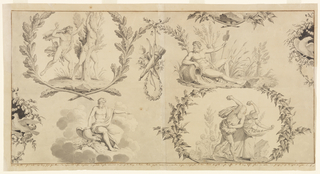 A design composed of four vignettes separated by wreaths: upper left, Apollo and Daphne (personifying Air); lower left, Jupiter and an eagle (personifying Fire); upper right, a river god (personifying Water); lower right, Deucalion and Pyrrha (personifying Earth). In center, a trophy composed of a torch, bow and quiver suspended from a garland, and a pair of doves appears at the repeat horizontally. Wreaths encircle the vignettes showing Air and Earth.